Navigation can be confusing, but the reward is an experience of some of the finest international art in Australia. Love it or hate it, the NGV International building certainly makes an impression. It’s hard to be ambivalent about a gigantic bluestone box surrounded by water. A major redevelopment by Italian architect Mario Bellini in 2003 didn’t soften the edges, and many have criticised the interiors for being labyrinthine. Still, you could do worse than get lost in a (free) gallery that holds a swathe of recognisable international artworks, along with other worthy pieces and fascinating decorative arts. Regardless of whether you’ve come for the freebies or for a blockbuster, you’ll enter to the right of the ‘waterwall’—a double-storey expanse of glass covered by a perfect sheet of falling water. You might also share our aesthetic qualms. Some of the permanent rooms feel ungracious hosts to their remarkable international decorative arts, furniture and fashion pieces. For example, flower-patterned wallpaper is a nod to the Japanese influence on 1880s Arts and Crafts timber furniture, but the effect is interrupted by a massive concrete column that runs through the middle of the arrangement. In the grander areas, ceilings are high and walls wide. Gilt frames shimmer and grey walls recede behind precious landscapes and portraits. There are tragic farm tales, beautiful bleak landscapes, tales of the wind and the sea, and noble portraits of high-chinned men in red coats and women in white dresses. Some feel tender, others pompous, but it’s impossible to view them and not feel something. The 20th century collection on level 2 hosts more challenging works—hazy blocks of colour, smudged paint scraped over canvas, and screen prints layered over photos. While it’s modest by global standards, there are significant works by important artists, such as Picasso, Turner and Rembrandt. For cakes and coffees or something more substantial, there are three eateries—the Garden Restaurant, the Tea Room and the Gallery Kitchen. Don’t wait for a major exhibition before you plan a visit—the general galleries are captivating and thoroughly worthwhile. 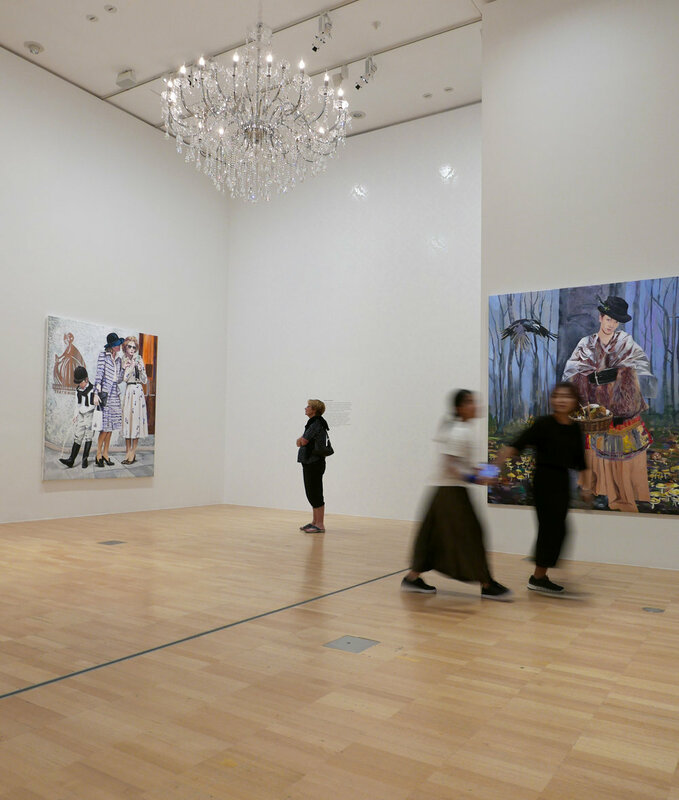 The NGV International, 180 St Kilda Road, is open daily 10am–5pm. Tram routes 1, 3, 3a, 5, 6, 16, 64, 67 and 72 all travel along St Kilda Road outside of the NGV International and the majority are accessible. Alternatively, NGV International is 10 minutes’ walk from Flinders Street Station across Princes Bridge. Parking is available under the Arts Centre Melbourne.